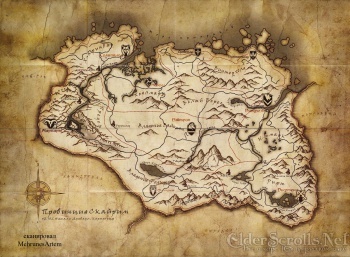 The land of Skyrim is going to be big. Really, really big. Late Sunday night, members of a Russian Elder Scrolls fan site posted what they claimed to be a map of Skyrim, pulled from a Collectors Edition of The Elder Scrolls V: Skyrim they somehow managed to get their hands on at Russian gaming expo Igromir. Fake or not, it's certainly impressive. The map features nine large cities, each marked with a different crest, with the landscape between them dotted with seven smaller towns. Surrounding the whole affair are mountains except to the North, where the Sea of Ghosts hugs the broken shoreline. Lakes, rivers, roads, and other points of interest make up the remainder of the world. And there is a lot of world to fill. Don't get me wrong, Oblivion featured a hefty amount of Cyrodiil to play around in, but a side-by-side comparison of Skyrim and Cyrodiil (which is pretty easy, considering they share a border) shows that while Cyrodiil seems large, it isn't quite as large as you might think, due to being hook-shaped and featuring loads of boring, bland water. Skyrim, on the other hand, features no such trickery. It is a seriously solid block of world, no doubt about it. Of course, this map is by no means official. Bethesda has yet to comment on its validity, and the only current English version may be fraught with localization and translation errors. So take this all with a grain of salt. Skyrim will be out November 11 for the 360, PS3, and PC.